I had a moment Friday morning that sounded a lot like Colin Firth practicing for “The King’s Speech”…cutting white base cardstock (I use 110# Neenah for bases – really heavy stuff), I cut the 25 I needed and OH! I only have 2 full sheets left. Yeah. Needless to say, I got right on the internet & ordered more (I was waiting to see if I would get a grant from the local arts council to help defray the cost of new supplies since some of my art work floated down Main Street in the July 30th flood.). Now my rainy day fund is gone. Still hoping for some amount of a grant! Supplies: Stamps – Clearly Besotted, Doodlebug Designs, Stampin’ Up!, paper – Neenah Classic Crest Solar White, Poptone Sour Apple, Stampin’ Up! Real Red, Smoky Slate, inks – Copic B00, C3, C5, E23, R29, YG17, Y13, Stampin’ Up! Pool Party, VersaFine Onyx Black, dies – Taylored Expressions, embossing powder – Filigree Fine Art Powder clear, twine – MarkerPOP. 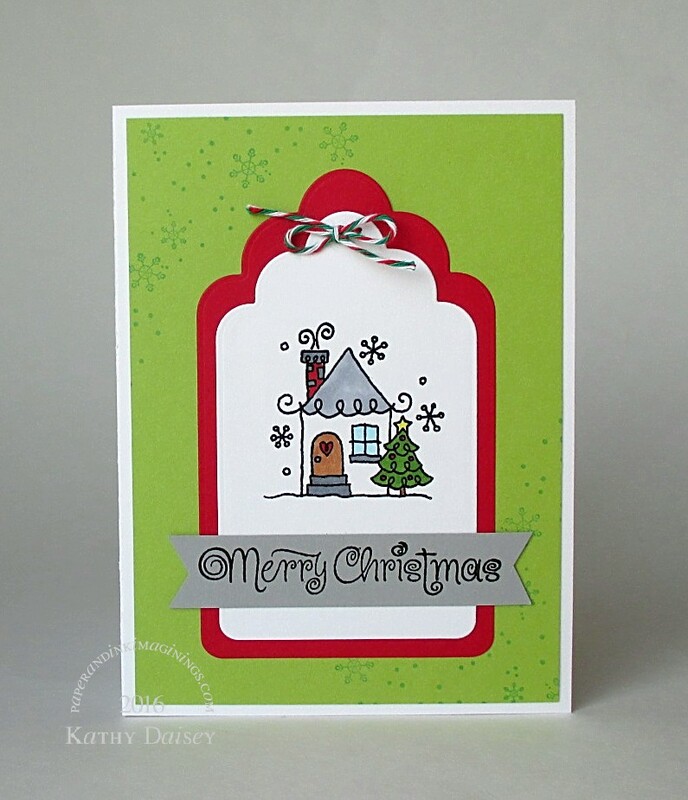 Categories: card, holiday | Tags: card, Clearly Besotted, Copics, Doodlebug Design Inc, MarkerPOP, Neenah, Poptone, Stampin' Up!, Taylored Expressions, Tsukineko, VersaFine | Permalink. Fingers crossed for the grant! Super festive card. Thanks so much, Cobs! I like “whimseyness”! Love this design! Everything works together just right! Love the colors. Winter and spring together.